Is your barkada (and your belly) ready to take on a food challenge? Do you want to binge on good grub and win money while you’re at it? 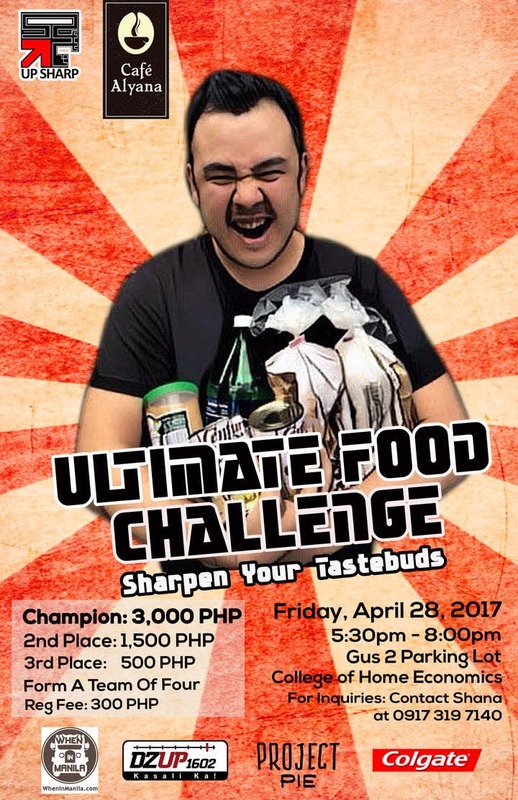 Get ready to eat and join UP SHARP and Cafe Alyana in an epic food challenge called The Ultimate Food Challenge (UFC): SHARPen Your Tastebuds! This is a food eating contest that tests not only your speed but also how well you know your food. Dine on various comfort foods and SHARPen your taste buds on each yummy morsel. It never gets boring as the UFC has 3 rounds, with varying mechanics per round. Gather into a group of 4 and head on to the Gusali-2 Parking of College of Home Economics in UP Diliman on the 28th of April, 2017, from 5:30-8:00 pm. Come hungry because you’re in for a big tasting adventure! Registration fee is atPhp 300 for the group. How sulit can a food trip get? To learn more, visit the UP SHARP Facebook page at facebook.com/upsharp or contact Alisa at 0915 120 0582. Established in 1970, UP SHARP is an academic organization dedicated to promoting the hotel, institute and restaurant course through related activities and events. UP SHARP also aims to hone the talent of future hoteliers and restaurateurs for the betterment of the industry and our country.